If you’re looking into a new pet but don’t want to settle for the usual cat or dog, geese might be a good pet for you. 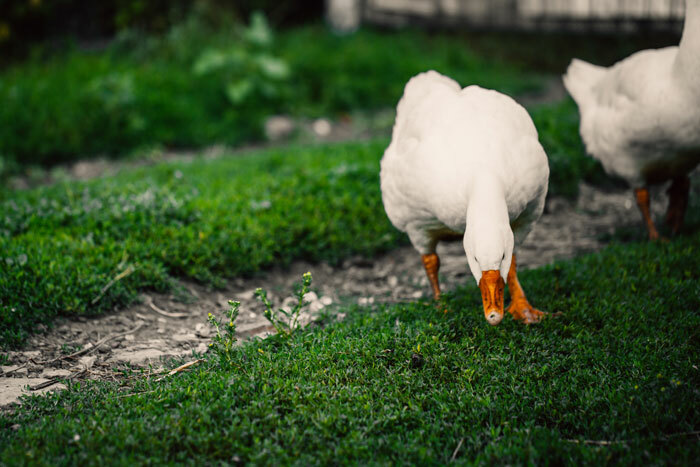 In order to own pet geese, you must have adequate space and check with city guidelines and neighborhood associations to make sure backyard poultry, ducks and geese are allowed in your area. Although many of us have heard the horror stories of aggressive geese attacking park visitors, pet geese who are hand raised and handled daily are often more docile. Before you jump into owning geese, there are a few things you should know and consider in order to create a comfortable living environment where your geese can thrive. Your first step in owning pet geese is choosing the right breed. 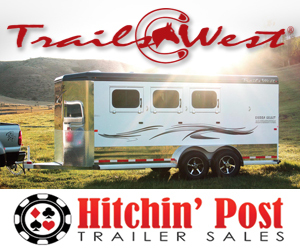 There are a number of breeds to choose from, many of them making great pets. Dr. Sharman Hoppes, clinical associate professor for the Texas A&M College of Veterinary Medicine & Biomedical Sciences, recommends breeds like the Toulouse, the American Buff and the Pilgrim, as these breeds are considered to be good pets by her clients. 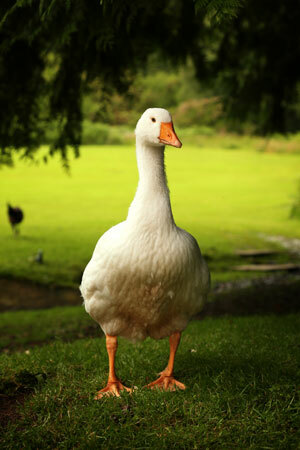 Geese are also flock animals, so consider getting 2-3 geese to help create a more natural environment. Females are less likely to fight with one another, so they may make a better option as pets. So what kind of housing do these birds need? To ensure your birds are comfortable and have enough room, at least one square meter per bird is recommended for indoor night housing, and two square meters per bird for outdoor housing. Include grass floors and secure fencing in your outdoor housing arrangement to protect your geese from predators like rats, coyotes, and neighborhood dogs. A larger pen filled with soft green grass should be available for your geese to roam during most of the day, providing a swimming area and more protective fencing. As a guide, three geese will typically be happy in a 20×40 foot pen. “Pet geese need a large yard with grass and housing that keeps them warm in the winter and can protect them from the heat in the summer,” explained Hoppes. “Geese also need water for swimming, so a pool or pond is a must. If you use a small pool as the water source it will need to be cleaned daily. 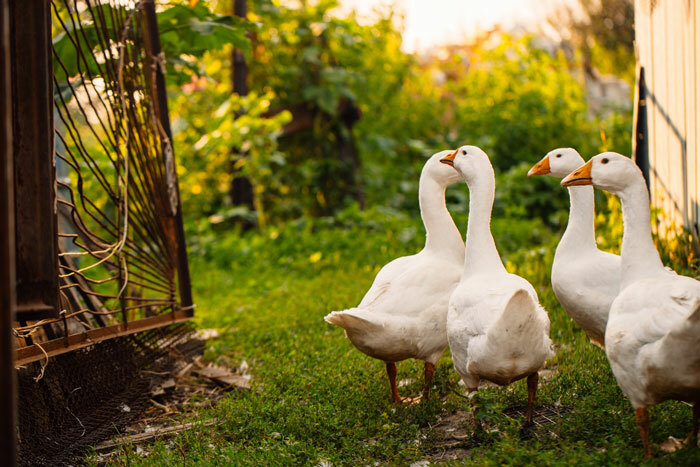 Geese can overheat easily on a hot summer day if there is no water or shade available.” If you would like to own pet geese, keep in mind that daily cleaning is essential. If geese are not housed in a grassy yard with a proper swimming area, serious health problems can develop. “Geese that are housed without a water source for swimming or on hard ground or cement tend to develop foot issues that can become life threatening,” said Hoppes. “Since geese are such heavy bodied birds they need both legs for ambulating, and if on an inappropriate substrate their feet will develop pressure sores that can lead to bone infections.” Other common health problems in geese include intestinal parasites (deworming is a must), limb deformities in young geese due to poor diet, and trauma caused by dogs, coyotes or other predators. Older females may also be subject to reproductive problems such as egg binding. “Anyone obtaining pet geese, waterfowl or backyard poultry should make sure there is a local veterinarian comfortable with birds nearby and available for emergencies,” recommended Hoppes. You may be wondering what kind of diets geese survive on, and fortunately for geese owners, the answer is grass. Up to 70% of their diet depends on grass, another reason why it is important to have a grassy area dedicated to your geese. Besides grass, geese will also feed on insects as well as commercial water fowl diets. 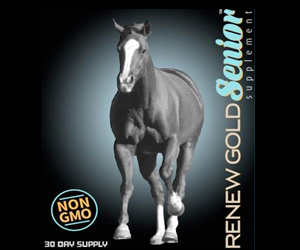 These are available for different ages of geese and should be fed daily, according to Hoppes. Besides companionship, geese offer a few other benefits. For example, geese are known to be very territorial and alert their owners when there is an intruder. Though they may seem aggressive, most geese are docile and will not attack your visitors, unless they are protecting a nest or chicks. Aggression during breeding season is quite common, so Hoppes recommends keeping an extra eye on your birds and visitors during that time of the year. Geese should not be around children without supervision, since geese attacks can cause serious injuries, including broken bones to the victim. Geese are also loud, a major reason why they are not ideal for residential areas. Geese tend to vocalize when there is anything new in the environment, including other birds, wildlife, the neighborhood dog or cat and anytime someone comes through the door. Geese also lay on average 10-50 eggs per year, allowing you to use them however you please (they might look huge next to a chicken egg, but they are certainly safe to eat). The feathers of geese can also be collected and used for crafts, such as stuffing a pillow. However, you should never pluck feathers from your bird because plucking can be very painful. Only use feathers that the goose has lost due to molting. If you are looking for a very smart and social pet that offers protection, a flock of geese might be the choice for you. Remember to keep in mind the environmental requirements for housing pet geese and the daily cleaning that is essential in order to maintain a healthy habitat. Lastly, do your research in finding a local veterinarian who is comfortable with treating birds. If well taken care of, geese can make a great companion animal that can live well into their teen years.